The price is the same as the original X-Wing Game (in some places cheaper), and can be found in most major toy/hobby shops as well as online at the links in my first review. 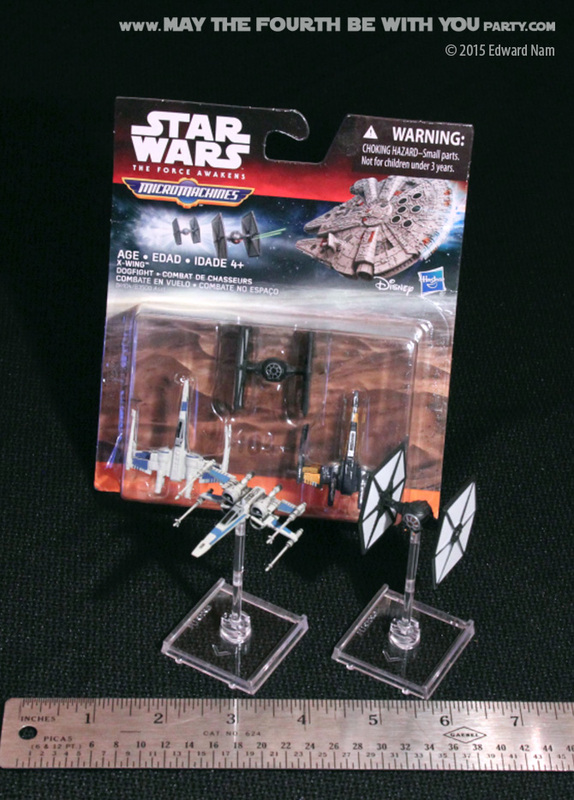 The ships are identical in size, and the set comes with two new TIE Fighters, and one new X-Wing, just like the original set. The set also comes with everything you need to play the game, so you don’t need the core set to play, you can get the The Force Awakens Expansion Game instead if you want. The photos below show the snazzy new ships. The other photos compare them with the original ships. 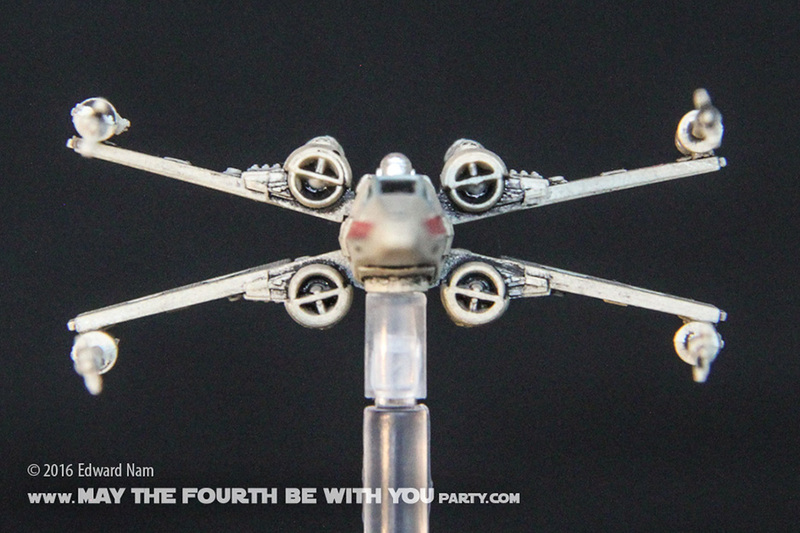 These closeup photos show the basic differences between the original X-wings and the new T-70 X-wing. The obvious difference is that the engine is split on the new T-70s so that you see two (larger diameter) split circle intake ports instead of the four on the original X-wings. Why would a spaceship need an intake port anyway? I don’t know – I try not to over-analyze these things! The other difference that is visible upon closer inspection is that the wings no longer overlap. So when the wings are closed (flat) the bottom wing is up front and the top wing is in the back. More subtle is that the new cockpit window is longer and the nose cone and rear (heptagon) is slightly different. Original X-Wing on the left, The Force Awakens (T-70) X-Wing on the right. 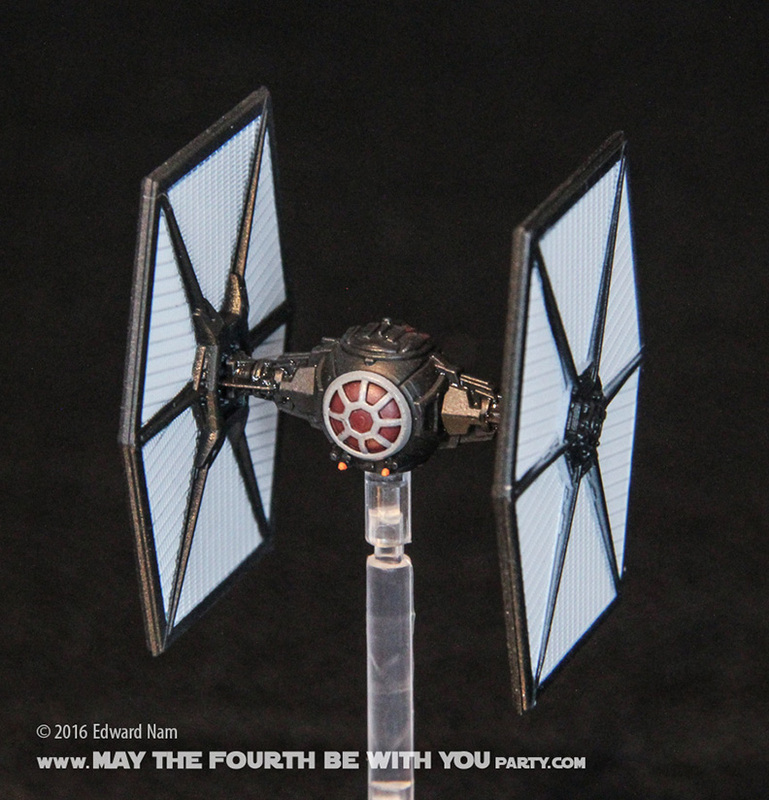 Original TIE fighter on the left, The Force Awakens TIE fighter on the right. 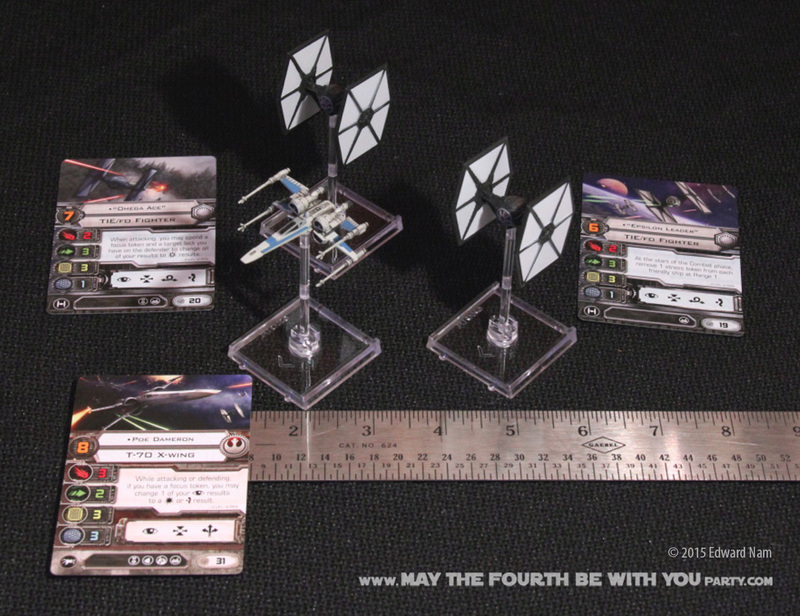 Interestingly, FFG decided to battle paint the original TIEs and not the new ones. In the movies, the Imperial ships are clean and shiny, whereas the rebel ships are (“scum”) dirty. Painting TIE fighters and other Imperial ships as dirty is not quite accurate. I’m guessing that this painting scheme make the miniatures look more real and less like toys. The photos below show the comparison with the new Micro Machines too. Of course, my 4 year old son needs to have matching ships! I’m guessing that after this coming round of Rebels (the TV show) ships, FFG will post more Force Awakens, or Rogue One ships. Stay on target! 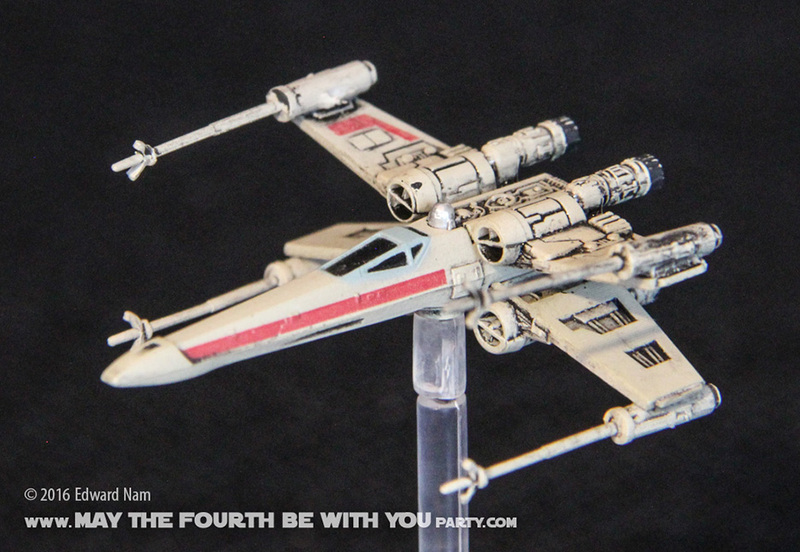 X-Wing miniatures is designed as a game, but as I’ve written in my previous reviews the ships are beautiful. I’ve mentioned that I prefer the small fighter combat, and I don’t like the game as much with the larger vessels. However as collectables, the reverse is true. The larger vessels are beautiful and collectable, and I really look forward seeing a Kylo Ren Command Shuttle. which I am assuming they will make in the near future. The smaller fighters are beautiful as well, but they are simply too small to display, except to place next to the larger vessels for scale. For collectable fighters, I prefer something closer to 1:72 scale, which is closer to the Galoob Micro Machine size – and the Hallmark Ornaments, for which I will write a review in the future. I haven’t played with these new ships, however I have skimmed the rulebook. I was pleased to also find a Rules Reference, which will come in very handy for tricky situations. It will also help answer questions that came up in the earlier version. The game mechanics and the movement tiles are identical. There are some new fancy maneuvers added to the ships though and of course, new pilots, droids (say hi to BB-8! ), and special weapons. The new X-Wings have identical basic stats, except one more shield point and a new boost ability (found in some of the newer expansion ships). The new TIE Fighters also are identical but with one more shield point – they can also acquire a target lock. They are a bit more powerful than their predecessors. The T-70 X-wing pilots all have the same pilot skill levels of 2, 4, 5, 8 with the highest being Poe Dameron. For squadron formation, both Luke Skywalker and Poe both have 8 skill points, however Poe (presumably not Force sensitive) is worth 31 squadron points whereas Luke Skywalker (very strong in the Force) is only worth 28 (presumably for the additional shield and boost ability). However, this might be another sign of game expansions showing “power creep” compared to the original version. The TIE Fighters still have 1, 3, 4, 5, 6, 7 pilot skill levels, but have an additional one point of shield and a targeting lock ability for 20 squadron points for the most veteran pilot, “Mauler Mithel” (compared to 17 in the original “Omega Ace” Tie). Overall, it should make a great addition to anyone’s collection, and you can even add them to your squadrons (if you don’t mind ships of different eras interacting). Let me know your thoughts, and again let me know if anyone wants me to post of tactics. 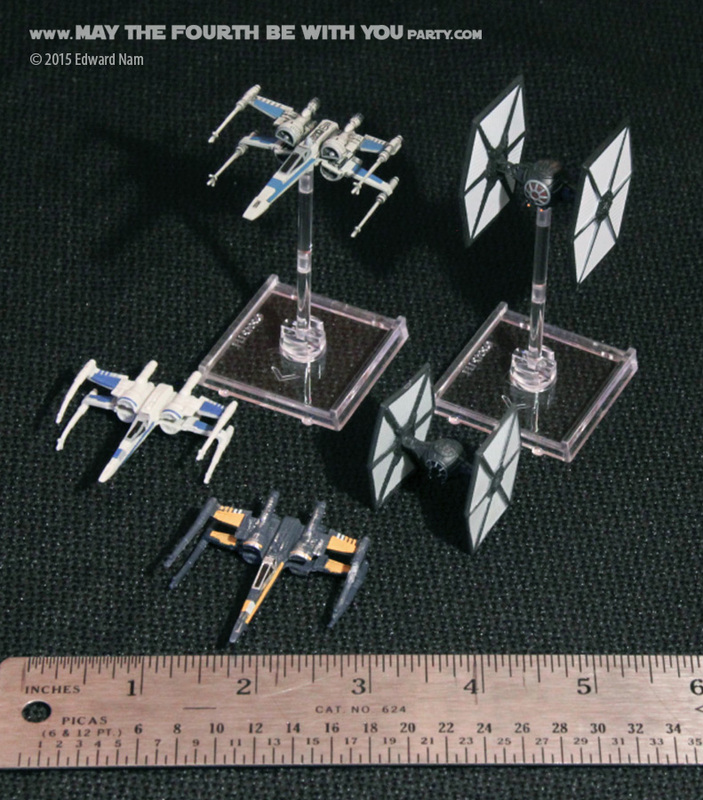 If you want information about the X-Wing Miniatures Base Game, click here for my earlier review. And check out my review for the Expansion Packs and additional ships here, which contains alot of detailed photos.